Using your iPhone with its built in TouchID or FaceID as the key would be a natural fit. Yep. We’re getting to the point that passwords will no longer be used. When Apple realeased TouchID they were ahead of the game. Currently it’s just used to authenticate Apple logins, but using biometrics to log in directly to websites is exciting. Apple’s Keychain (password managers) was better than the alternative, but this is better still. Hopefully, this leads to more users using 2FA (or multfactor authentication). So, you could use your biometric scan to log into your banking site, then your pin (saved in Keychain) for extra protection. In that method you’d use biometrics twice. But, you could use any variation. You have a new IPhone XS. The phone is set up to use FaceID for yourself and your child (spouse, girlfriend, dog, etc) so both individuals can use the phone. With WebAuthn that’s not the case. Worst case, they’d have access to your pins saved in Keychain, and wouldn’t have access to (for example) your banking site which requires your biometrics scan at the time of login. Will this make your internet activity Google and Facebook snoop proof? Well, they seem to be talking about an external hardware device, like the old USB keys we used to get with expensive software, years ago. So this is a bit confusing. If we could use Touch ID or Face ID, then why have these things too? And, would they need to be used each time? If so, that’s a major pain. Would we have to carry them with us everywhere we go? What if we lose it, or forget it? This is different: the corporation or institution gives you a hardware key to login to their web site or mobile application. This hardware key may also be your digital signature that represents you before the law. Touch ID and Face ID may only act as the access password to those hardware keys as an additional layer of security. Most of those gadgets have outdated libraries and require Java. Web Authn may be a solution to that. It is possible to use your iPhone to trigger your digital certificate provided that your carrier maintains that certificate for you and runs a SIM application on your iPhone you’ll use to sign. The carrier must also provide a “mobile signing” infrastructure to involved institutions. Again in this case Face ID and Touch ID act only indirectly as access passwords to that “phone with SIM with mobile signature”. and yes other platforms also support it. 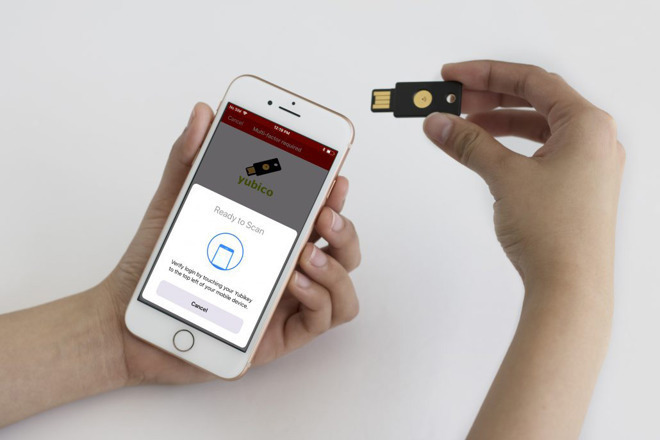 https://www.yubico.com/2018/08/10-things-youve-been-wondering-about-fido2-webauthn-and-a-passwordless-world/ I normally have mine with me but there's been times when I haven't. There are allowances for that. Thanks for the additional clarification. You are correct in noting that Touch ID and Face ID are by themselves only addressing authentication and not authorization. As you suggested it would be useful if Apple provided a way to store hardware keys in the Secure Enclave and be able to use your Touch ID or Face ID authentication to retrieve the hardware key, much like password vaults work on iOS. The last thing I want is to carry around another dongle. These allowances are only partly useful. If you’re going on a trip, and you lose your primary key, unless you take your backup along, you seem to to out of luck, unless you also have passwords for all of your needs too.